The Tigers won a playoff game at Yankee Stadium today. It does not get any better than that. This game absolutely showed that they can play with the Yankees. It's still going to be a really tough series but I feel more confident right now than I did after game 1. They now have the home field advantage. That doesn't usually help this team much but I'd much rather see them play at home than at Yankee Stadium in post-season. I had my annual eye exam at 4:15 so I missed most of the bottom of the 9th inning. I sat in the office for 15 minutes and they didn't call me in. I couldn't handle it anymore so I left the office and ran to my car. I turned on the radio just in time to catch the last out. I then ran back to the office and I was called into the office as I walked through the door. My eyes are fine. The young Tiger pitchers made us proud today. Justin Verlander walked 4 and allowed a 3 run homer to Johnny Damon but he got through 5 2/3 innings with no other runs scoring. He threw as fast as he has thrown at any point during the season (100 MPH or better on several pitches) and his pitches had great movement. If there was any evidence of fatigue, it was his control. Overall, he did well though. 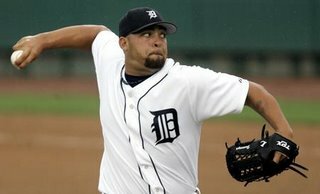 Joel Zumaya got me about as pumped up in the 7th and 8th innings as I've ever been watching a baseball game. He struck out Derek Jeter with one out in the 7th and then got Bobby Abreu on any easy grounder. Gary Sheffield lined to center fielder Granderson on the first pitch of the 8th. He then struck out Jason Giambi swinging on a 103 MPH fastball and Alex Rodriguez on a 101 MPH fastball. It was Vintage Zoom. I was really afraid Todd Jones would blow the game as I sat in the doctor's office. He had an excellent season in his closer role but no matter how many timss he gets the job done, he still scares me. He continued to show that he was an good off-season acquisition though. It's now Carlos Guillen 1 Derek Jeter 1 in the battle of MVP caliber shortstops. Guillen doubled and hit a game tying homer in 4 at bats. Jeter had a rough day going 1 for 4 with an error and he popped up a bunt attempt. Curtis Granderson had another big game today. He hit a sacrifice fly in the 5th and tripled in the go ahead run in the 7th. That triple was another of the unforgettable moments in today's game. Granderson is showing the Yankees something so far in this series. And don't forget Marcus Thames. He is clearly healthy again going 3 for 4 with 2 runs scored. Game 3 is tomorrow night. It will be Kenny Rogers against Randy Johnson. Rogers is the type of finesse pitcher who I expect might have trouble with the Yankee line-up. It will be important for the Tigers to hit Randy Johnson who has been suffering for back problems. I think they will. I'm expecting a fairly high scoring game.